These days, no self-respecting website designer creates sites without taking mobile devices into consideration. The same could—or should—be said for those charged with designing control rooms; while the main control hub may continue to exist within four walls, those barriers are somewhat fluid as session participants dial in and out using any number of devices. The challenge: enabling your control room to be truly agile while remaining within your organization’s security requirements. “We’re dealing with people on laptops, and phones, and tablets, and it’s not just voice and video, it’s content as well,” said Adam Cuzzort, senior director of engineering at collaboration system developer Prysm Inc., in San Jose, Calif. Cuzzort noted that not only do the voice and video streams that are traveling to and from control spaces need to be protected, but tech managers must consider how the content that is being shared remains secure while in transit, as well as at rest. “Security of that information in transit involves things like encryption and secure protocols, and security at rest [takes into account]: how are my files stored? How are they protected while they’re stored? Who has access to them?” And, are they encrypted while not in use? Ostaffe cites air-gapping as a means of achieving this separation between public and private networks, while allowing users to have access to both secure and unsecure domains simultaneously. “You have an outside network and an internal network, but there are no computers that are connected between those two networks so they can’t touch each other,” he explains. 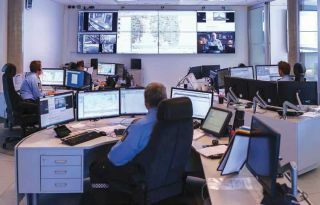 For example, a control room operator may be monitoring four screens on their desktop, three of which are on the internal (secure) network, and one on the corporate network, which has access to the internet. “The system would be separate from the internal systems, but at the desktop level the user could have access to both the secure and unsecure domains.” He noted that Black Box’s InvisaPC IP-based LAN/WAN KVM (Keyboard, Video, and Mouse) product enables users to do this remotely through virtualization. Collaboration plays a crucial role in control rooms, which means that tech managers must think about the implications of BYOD in this environment. David Schweer, director of product marketing at Prysm, noted that one challenge for tech managers is confirming that BYOD users are regularly updating their devices so that they are running the latest security functionality. “I think it’s only going to become more difficult, because we’re seeing more competition amongst devices, and how those devices pair with the software, and people going out and buying their own device,” he said. Black Box’s Coalesce wireless collaboration solution accounts for BYOD by, once again, keeping things separate: visitors or guest users in the control facility may share their content wirelessly without having access to the corporate LAN. “[For example] certain users with mobile devices can have access and share content to one of the windows on the video wall, or one of the screens, but still not have access to the secure network from that device,” Ostaffe explained. The What: Adder Technology, the KVM specialist, is now offering the AdderLink XDIP, the latest solution in the company’s Adder-Link KVM and AV extension line. The new extender enables users to locate critical computing hardware in secure and temperature-controlled environments, away from the user workstation, while maintaining the original desktop experience, using standard network infrastructure. The What Else: As computing ecosystems grow in complexity and teams are increasingly looking to manage several remote sources through one workstation, the need for flexible extension without the loss of quality is critical. The AdderLink XDIP can extend video, USB2.0 and audio along a single minimum spec of CAT5e cable for 100m, further by routing through an organization’s infrastructure. It is flexible when it comes to workstation interfaces, connecting with a large range of USB devices including mice, keyboards, touch screens, jog shuttles, graphics tablets, joysticks and 3D explorers, and also has a local feed through port. Delivered in a zero configuration state so users can plug the units in and start working immediately. No drivers or software are needed.